The political battle lines have been drawn on pension and tax policy in the final weeks of campaigning ahead of the general election. The major parties have now all released their manifestos, and in some cases pledges have already been rewritten. One of the Conservatives’ key election pledges is to reform the funding of long-term care. But four days after this was announced Prime Minister Theresa May said there would be further consultation on details after the election, which is likely to to result in an as yet unspecified cap on the total cost of care. What is clear is there is little political agreement on some of the fundamental issues affecting financial planning. So where do the main parties stand on key financial issues – and what might these promises mean for advisers? The Conservative’s manifesto pledges to “link the state pension age to life expectancy” but there are no further details about how this will be achieved. It also includes watering down the state pension triple lock and means-testing winter fuel payments. 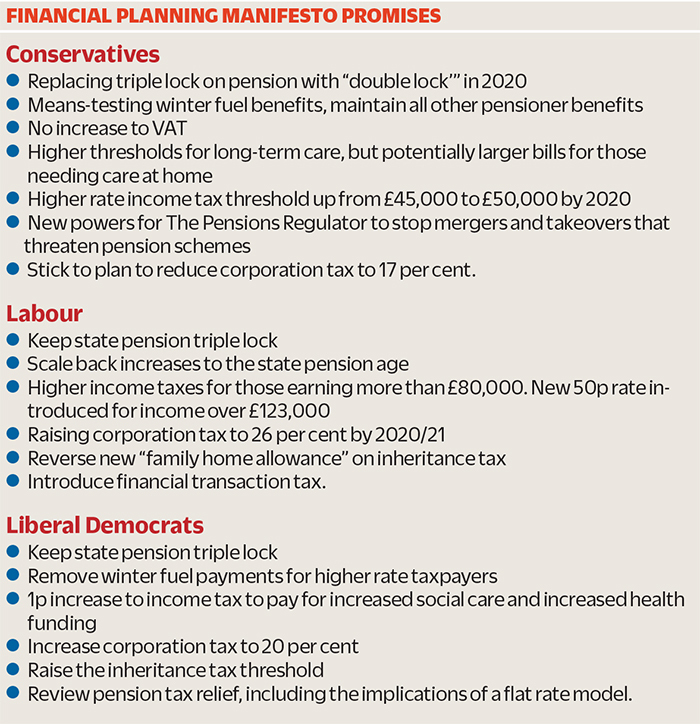 Labour has pledged almost the exact opposite: promising not to raise the state pension age beyond 66, to keep the triple lock and universal winter fuel benefits. Hargreaves Lansdown head of policy Tom McPhail says: “These generous and expensive pensioner promises seem designed to garner as many votes as possible. Much of the focus on pension policy has been centered on the state pension. The Tories have said they will replace the triple lock with a “double lock” in 2020, where the state pension will rise each year by either inflation or average earnings, whichever is higher. Labour and the Liberal Democrats though are both committed to retaining the triple lock mechanism, which includes the benchmark of 2.5 per cent. She describes this promise as a “political construct” that did not necessarily protect the oldest or the poorest pensioners who were more likely to rely on pension credit which falls outside the triple lock. Labour is also rolling back proposed increases to the state pension age, suggesting it will remain at 66 from 2028. This will particularly benefit the so-called Waspi women. Although Labour claims its promises are “fully costed”, there are questions about how it would fund this change, particularly with increased longevity. Altmann suggests the party could increase the number of years of National Insurance contributions needed to qualify for a full state pension but this would still leave a substantial funding gap. The Liberal Democrats are alone in suggesting a review of pension tax relief. This topic is conspicuously absent from the other manifestos. But this has created an air of unease among pension firms, as no party has explicitly pledged to protect the current system either. Aberdeen Asset Management head of retirement savings Gregg McClymont says: “The worst-case scenario would be lots of itty-bitty changes. This could undermine confidence in long-term savings. But McPhail says: “Whichever party forms the next government I suspect there will be further changes to the taxation of pensions.” He says this could be more “salami slicing” of allowances and reliefs such as the annual and lifetime allowance or a more “root and branch review” . The Conservatives have abandoned previous pledges not to raise income tax, NI contributions and VAT. While they have promised to keep taxes “as low as possible” their only firm manifesto promise is not to raise VAT. This should give the Conservatives some flexibility when it comes to raising revenue, should the economy worsen or if the Brexit negotiations do not go as planned. The Conservatives have maintained a promise to raise the higher rate tax threshold from £45,000 to £50,000 by 2020, and increase the personal allowance from £11,500 to £12,500 over the same period. Labour says it will increase income tax for those earning more than £80,000 a year, but has pledged not to increase income tax or NI for those earning less than this. Under Labour’s plans the additional 45p rate will kick in at £85,500, with a new 50p rate being charged once earnings top £123,000. Currently, the 45p rate is only paid by those earning more than £150,000 a year. The central plank of the Lib Dems’ tax policy is a 1p increase to income tax. This would affect basic, higher and additional rate taxpayers and is expected to raise £6bn, which the Lib Dems say would be ringfenced for NHS and long-term care funding. This has become one of the most contentious issues of the election campaign. The Conservatives led the way by proposing significant changes to the way people pay for long-term care. They suggested the threshold at which people are means-tested be raised from £23,250 to £100,000. But the family home would also be taken into consideration if people receive care at home, unlike now where it is only taken into consideration if someone needs residential care. But following a political backlash and rumblings about a “dementia tax”, the Conservatives have said there may now be a cap paid on total costs. This would bring the proposals closer to the recommendations suggested by Andrew Dilnot in his previous review into long-term care funding. Both Labour and the Lib Dems have said they will provide more extensive funding for long-term care. Webb says: “It is good this issue has been raised and has become part of the national debate. There are clearly difficult questions to be asked. The Conservatives said they would continue to promote long-term savings and pension products, including the Lifetime Isa. But again there was no further detail.